As Netanyahu prepares for his four day visit to India, sources confirmed that the jeep has "indeed" left for India and "would be arriving on time" to be presented by the Israeli Prime Minister to PM Modi. 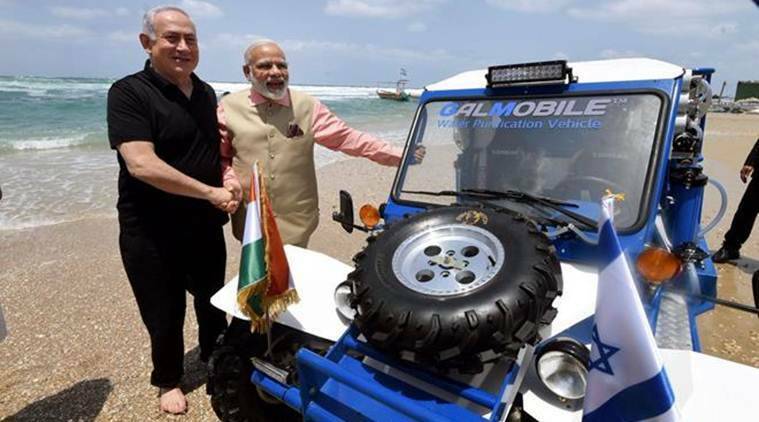 Visiting Israeli Prime Minister will present his Indian counterpart Narendra Modi a special gift – the Gal-Mobile water desalinisation and purification jeep the two leaders rode on Israel’s Olga beach last year. The jeep has reached India, sources here confirmed. “It has reached Delhi and is on its way to Bhuj,” sources here said. “There will be a live demonstration of desalination of sea water that the two Prime administers will witness through video conferencing from the iCreate centre on January 17,” they said. Netanyahu and PM Modi waded into the Mediterranean Sea and rode the “buggy” jeep on the coast during the latter’s visit to Israel in July last year. The jeep is said to cost around 390,000 shekels (approximately USD 111,000). Gal-Mobile is an independent, integrated water purification vehicle, designed to produce high-quality drinking water. It can be useful in natural disasters like floods, earthquakes, military use in difficult terrain and rural areas to provide drinkable water. It can purify up to 20,000 litres per day of sea water and 80,000 litres per day of brackish/muddy or contaminated river water and bring it to WHO standards. The two prime ministers had witnessed the demonstration of sea water purification technology pioneered by Israel at a water desalination unit on the Olga Beach during the Indian Prime Minister’s visit to Israel. “When you and I walked shoeless along the Mediterranean shore, we drank sea water that was purified before our eyes using technology that will save untold lives. India and Israel are working together to provide clean water, to increase crop yields, to keep our people safe from terrorism and other challenges to the future we both seek,” Netanyahu said yesterday in New Delhi. PM Modi at the India-Israel Business Summit yesterday said Israel’s technology for land, water or space has won appreciation. “In fact, hailing from a water deficient state in India, I have particularly admired Israel’s water efficiency,” he had said.